We mow the dale together. In mountainy parts of Donegal where small pockets of corn ripen among stone and heather one may see even the sickle at work, for Donegal is a county of great littleness of field and fold, and immense patchwork variety. Ulster has a greater swarm of these dumplings – streamlined deposits of boulder clay carried there by glaciers in the Ice Age – than any other country, and they form most valuable farming land. Of all the Irish counties Donegal is, to my mind, the loveliest and the mountainous peninsula of Inishowen, dominated by Slieve Snacht, one of its loveliest parts. This territory was once owned by the O’Dohertys, and even today, as the saying goes – “You can’t beat a bush in Inishowen without ‘rising’ an O’Doherty” the family seat of Sir Cahir O’Doherty, the last proud lord of the clan may still be seen at Buncrana. 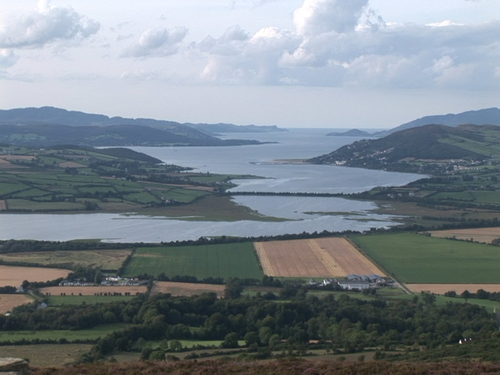 It was he who with Spanish hat and high heron feather sacked and burned Derry whose governor had insulted him; his fatal action led to the Plantation of Ulster by the English and Scotch settlers of James I.
Lough Swilly in 1607, the last of the Irish Earls set sail for the Continent. Here too, in 1798, the English fleet brought the captured French battleship Hoche with Wolfe Tone, the ill-fated Irish patriot, on board. Buncrana is a real hidden gem that is worth a visit on your tours of Ireland.